How often do you slideout Google Play’s navigation drawer and enter the “My Account” section? I think I’ve done it all of once, probably when I wrote up this story. I may have done it another time or two to check on account history or to add a new payment method, but honestly, I forgot it even exists. That’s too bad really, because Google is adding “Rewards” in there for promos you may have waiting for you. 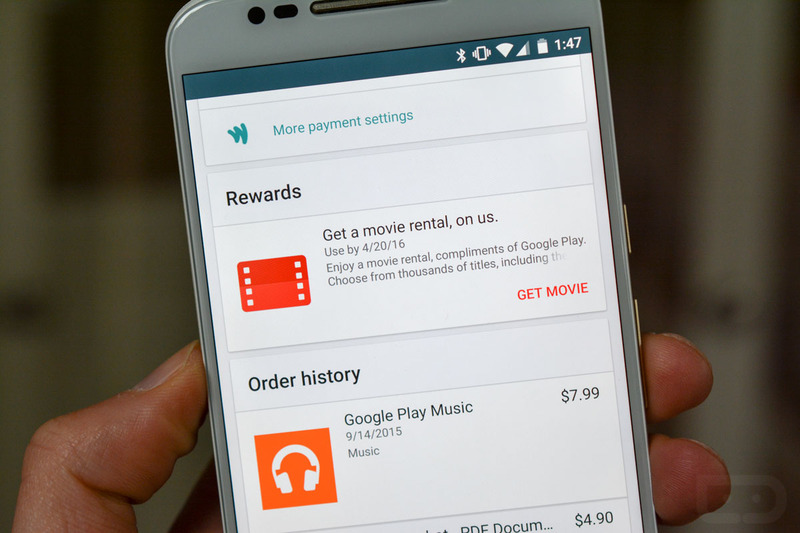 In the Google Play rewards section, I’m currently seeing a reminder for a free movie rental, likely because I bought a Chromecast or two at some point. Thanks, Google! A couple of us are seeing this “Rewards” section, along with this reminder to grab a free rental, but I’d imagine Google will use this section for additional goodies that you need to redeem. Since it’s kind of tucked away in a place most of us rarely check, we wanted to make sure you were all aware of it. Anyone else have any rewards to claim?